The active ingredient of Albit is a microbial biopolymer poly-β-hydroxybutyrate (PHB). PHB is a natural storage compound of beneficial soil bacteria (like starch in plants or fat and glycogen in animals). In the cells of bacterial producer, Bacillus megaterium, the content of PHB reaches 77% of its dry biomass. Another bacterium, Pseudomonas aureofaciens, enhances the synthesis of PHB by the principal producer. Depolymerases and other enzymes excreted by P. aureofaciens also convert PHB into a form (oligomers, β-aminobutyrate) physiologically active in plants. Specially selected set of mineral compounds (magnesium sulphate, dipotassium phosphate, potassium nitrate, urea) amplifies the effect of PHB for approximately 10 times, and also acts as a preservative, saving PHB from rapid decomposition. When Albit is being applied, this set of mineral salts acts as a starting dose of nutrients for plants. PHB and its derivatives interact with the receptors of NADPH oxidase system which are located on the surface of plant cells. Enhanced activity of NADPH oxidase in plants leads to the formation of superoxide and other reactive oxygen species (ROS) in concentrations higher than the norm but not deleterious to the plants. This process triggers expression of cascade of plant antioxidant enzymes (superoxide dismutase, peroxidases, dehydroascocorbate reductase, glutathione reductase) which are able to detoxify ROSes. Increased level of antioxidant enzymes in plant cells brings about higher content of ascorbate and chlorophyll (up to 100% increase to control). Since virtually any stress in plants ultimately leads to the accumulation of ROS and impairing of chlorophyll, plants pre-treated with Albit possess much higher stress resistance. Under field conditions, increased stress resistance was detected towards drought, heat, chilling, pesticidal stress, chemical contamination of soils etc. Ascorbate may easily distribute across whole plant, amplifying stress resistance even in those organs which were not treated with Albit. 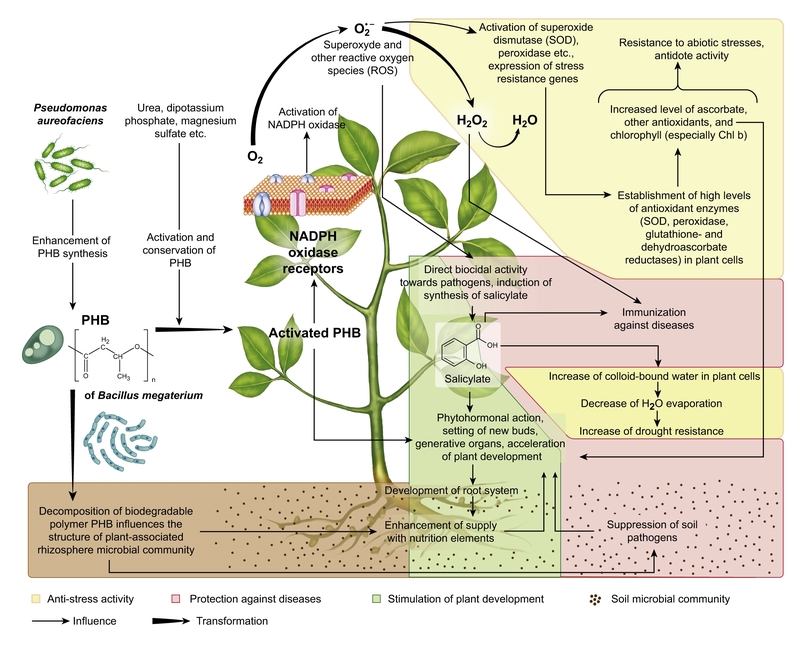 Activation of NADPH oxidase as a response to the application of Albit leads to the synthesis of superoxide and peroxide (which exert direct biocidal effect on the pathogens managed to penetrate into the plant). Also, it causes the synthesis of salicylic acid, a very active signal compound. Salicylate immunizes the plant against diseases, and plant tissues acquire resistance towards wide range of pathogens (Systemic acquired resistance). Synthesis of phytoalexins (natural compound preventing of pathogen development) increases in plant cells. For example, after Albit treatment phytoalexins of stilbene nature are synthesized by 33% more in grapes. As a result, the total antioxidant capacity of plant cells (the TAC) increases in 1.4-3.6 times. Albit acts very much alike systemic fungicides, though while they distribute across the plant and exert direct biocidal activity towards pathogens, Albit causes wide distribution of natural signal metabolite (salicylate), and as a result even those plant organs which have not been treated with Albit get immunized against diseases. In addition to immunizing action, salicylic acid causes accelerated origin of plant shoots and generative organs of plants, i.e. stimulates their development. Salicylate and transformation products of poly-hydroxybutyric acid have a strong phytohormonal (auxin) action. Auxin activity of Albit in working concentrations is equivalent to 10-3 M solution of indolylacetic acid. This leads to stretching of the cells, the laying of new buds, flowers and shoots, and, finally, to increase yield. 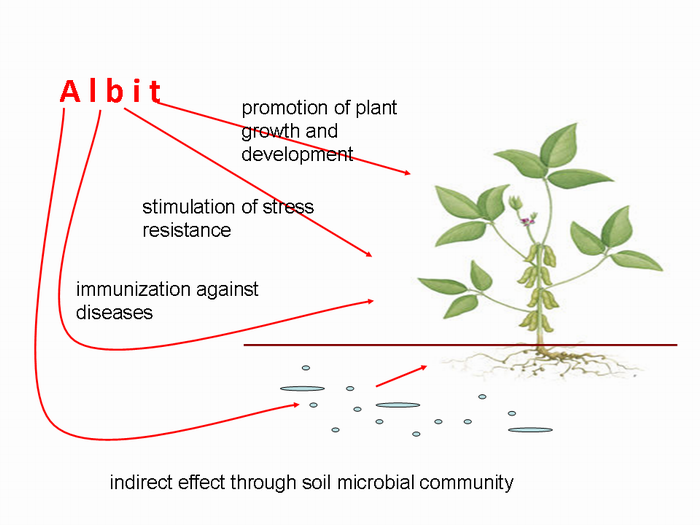 The last mechanism of action of Albit is its indirect effect upon plants through rhizosphere microbial community. When seeds are treated with Albit, PHB acts on the plant receptors, but as well gets into the rhizosphere (soil area around plant roots) in considerable amount. The latter leads to alterations in rhizosphere microbial community associated with plants. As a result, such pathogenic fungi as Fusarium are suppressed, and in contrast beneficial fungi of genera Сladosporium, Trichoderma, and Gliocladium proliferate (increase up to 600 % to control). This phenomenon is an analogue of exogenous application of living biofungicides. Albit itself does not contain living microorganisms, though due to its regulatory activity on indigenous microorganisms, the abundance of Azotobacter and other N2-fixers increases, nitrogen fixation, phosphate solubilization, and supply of plants with nutritional elements are enhanced. The carry-over of nutrition elements from soil and fertilizers into plants increases by 24-25% (N), 26-40% (P), 9-20% (K). The extra supply of plant with nutrition elements compensates for the additional energy costs of the plant organism to immunization, accelerated growth and development, induction of stress resistance. To conclude, it can be stated that Albit acts as a multitask well-balanced protective and stimulating agent embracing all vital areas of plant life.